Jaded Blossom: Wood You Be Mine? Stacey from Stacey's Creative Corner here with my very first post as a Design Team member for Jaded Blossom!! WooHoo!! I'm so excited to be a part of this team alongside these talented ladies! I hope you all like the projects I make using those awesome Jaded Blossom products! I normally start working on my Valentine projects early January so I have a Valentine card to share with you today. 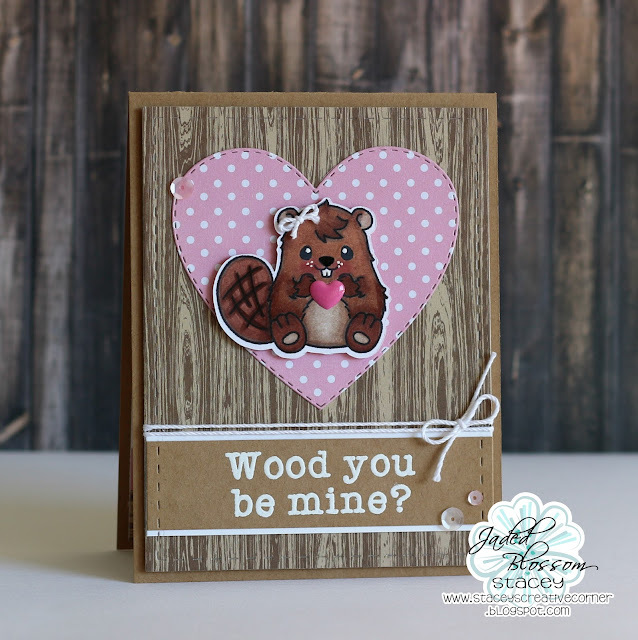 To create my card, I cut out some wood patterned paper using the Card Mat Dies. I heat embossed my greeting with some white embossing powder onto a strip of Kraft cardstock, added a bow and popped it all up with foam tape onto my card base. I love this little beaver from the Eager Beaver stamp set!! I think she is so super cute! I colored her up with some Copics and added her on top of a heart from the Heart Dies 2 set. This is adorable .. I look forward to seeing your inspirations. Congrats!! Adorable card, and super cute Beaver!!! GARAGE CRAFTSMAN site concerning the PSI of power washing is generally a small less than with pressure cleaning. Power cleaning is often used on houses, particularly types with man-made or even wood siding, whereas stress washing is more used for concrete, rock, as well as driveways. Great web-site overall experience! We're able to possess become a much better offer somewhere else. Incredible product in a excellent cost in addition awesome customer support, the entire team was wonderful to work with. I would strongly recommend all of them for just about any secure fencing requirements.